Awesome review Stephanie. I’m on the third book now and I can not stop reading this series!!! Thanks! It is certainly addicting! I hope you continue to enjoy it. This series is so addicting!!! I can’t wait to read this one! It really is! I hope you enjoy this one! Excellent review! You nailed all the major points. I know a lot of people are hating on the depiction of Easton in this book right now, but I’m hoping for a major pay off in the next book. I hope he’s back to being the Easton I liked at the end of books 2 & 3. Thank you! I don’t remember really loving Easton’s character in the earlier books (I liked him, but didn’t LOVE him) so maybe I had different expectations than what most other people seem to have. And honestly, I’d rather see him a little brooding than acting like a crazy kid on drugs. If the whole book would have been him doing things like that first chapter I would probably not have finished the book haha. 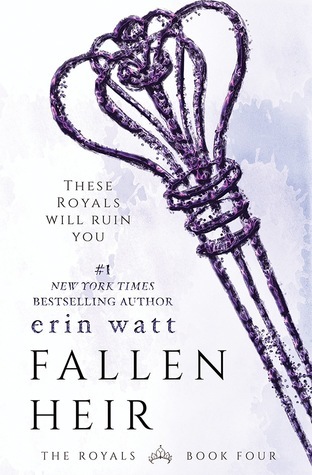 I recently started the Royals series and I’m struggling to read book 3, and I think you’re right about the lack of addicitive-ness as the story progressed. Good to know Easton’s story picks back up. Yeah I felt the same way about the third book. This one was much better, in my opinion. Yes, I thought there was a lot less drama than in the last two books. There’s going to be at least one more, so it might be worth waiting until that one comes out so you don’t have to wait since this one ends on a cliffhanger! I liked this one a lot more than Twisted Palace. I think it’s less drama-filled and slightly more realistic. Some people went crazy for the over the tope drama, though, so I guess it depends what you want out of it.